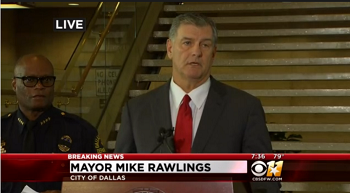 The Dallas police chief, David O. Brown, said that four people armed with rifles were believed to have carried out the attacks. They positioned themselves in triangulated locations near the end of the route the protesters planned to take. The police had three people in custody and were negotiating in the early-morning hours with a fourth, who was in a garage in downtown Dallas at the El Centro community college. Latest reports indicate the fourth suspect is dead. There is no other information at this time on their identities. Early on in the event, police shared a photo of a "person of interest," black man at the protest carrying an AR-15. It is legal in Texas to do so, but the photo ran across the media and the Internet. Very quickly it became apparent from videos shared on social media that this man had not been a shooter. He was down on the street in the crowd. The gun was not loaded. The situation was. He is very lucky he is not dead. Why people feel the need to carry and display firearms and why lawmakers feel the need to enable (and encourage) that is beyond me. That police tend to treat whites and blacks carrying firearms differently — the origins of the protests last night across the country — remains a problem to be addressed. This could be another long, hot summer.